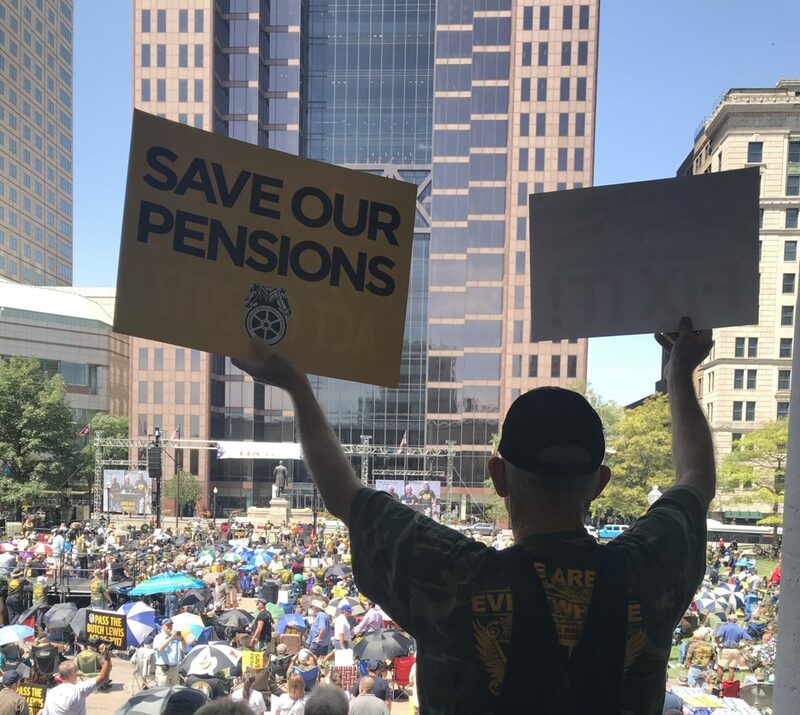 In the months before midterm elections, thousands of Ohio Valley workers and retirees have rallied over an often overlooked issue: Pensions. There are serious questions about whether pension funds for miners, teamsters, teachers and others will remain solvent. As labor leaders look to Congress for action, those questions are coming up in the region’s midterm campaigns. Becca Schimmel explores whether concern about pensions will show up at the polling place. Thousands of union coal miners and their families gathered this summer in Columbus, Ohio, wielding signs and wearing camouflage United Mine Workers of America shirts. UMWA President Cecil Roberts led the crowd in a call-and-response chant. But the miners weren’t there for a strike or to picket a company over a contract dispute. They were demonstrating to draw attention to an often overlooked issue: Pensions. 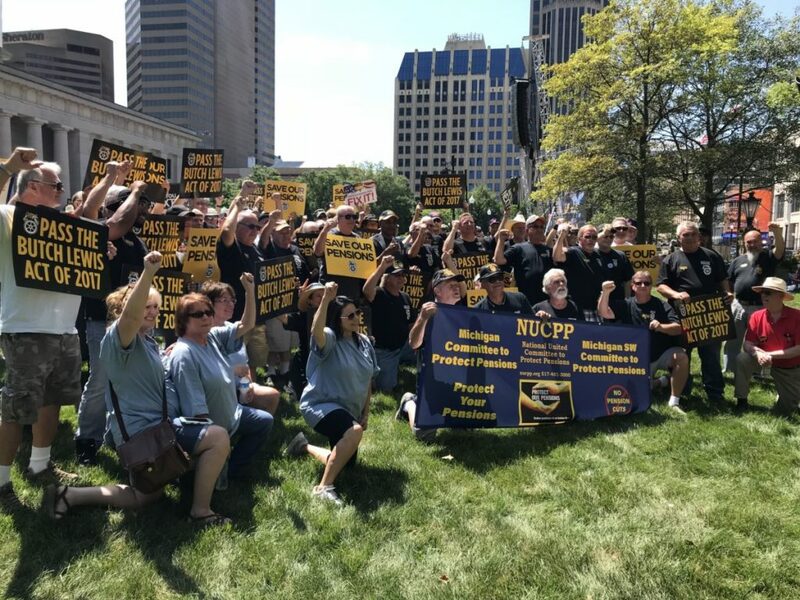 In the months before midterm elections, thousands of miners, retirees, and other union members from around the Ohio Valley have joined rallies and made road trips to lobby lawmakers over the shaky financial condition of their pension funds. It’s not just miners. Workers represented by the Teamsters, Ironworkers, and the Bakery, Confectionery, Tobacco workers and Grain Millers unions are all worried about the security of their pensions. Uncertainty about pensions also played a big part in the teacher strikes in West Virginia and Kentucky. Labor leaders are looking to Congress to help shore up shaky pension funds and they pledge to make pensions an issue when voters head to the polls in a few weeks. The issue could play a role in the region’s two competitive races for the U.S. Senate, as Democrats Joe Manchin, of West Virginia, and Sherrod Brown, of Ohio, seek reelection in historically union states that went for President Trump in 2016. Larry Miller of Ohio County, Kentucky, mined coal for 20 years before retiring. 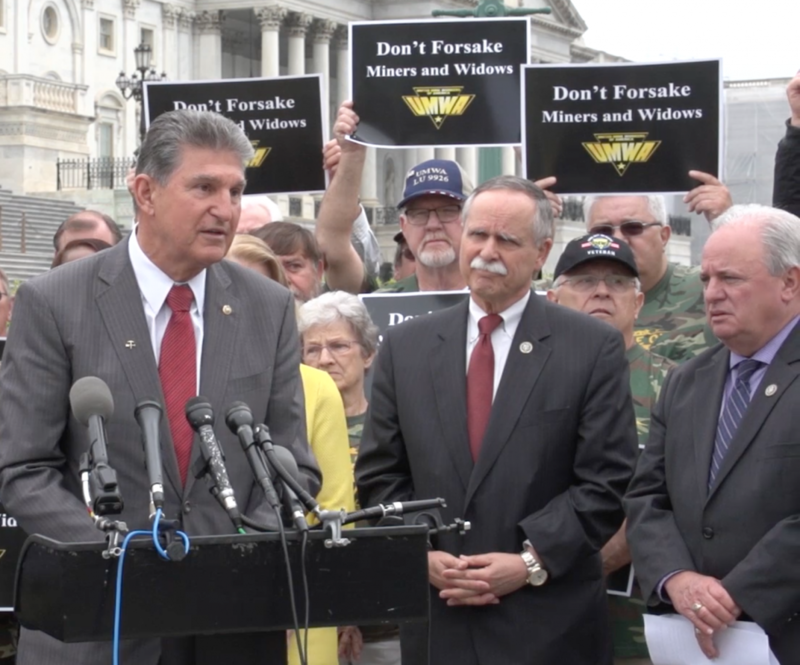 He was among a group of UMWA members who worked the halls on Capitol Hill last month to encourage support for a measure to shore up the miners’ pension fund. He said pension security is his top voting issue. Miller said he and his wife based their retirement on social security and his pension. He said if they lose one leg of that they’ll be faced with tough financial decisions. Miller said he isn’t the only one either. Without those pensions many widows and retirees won’t be able to get by. Phil Smith is a spokesperson for the UMWA. Smith said if these miners don’t have their pensions that will pull money out of small coal community economies, putting more strain on social programs. “Here’s something that you can count on. The cost of providing social services is going to go up,” he said. 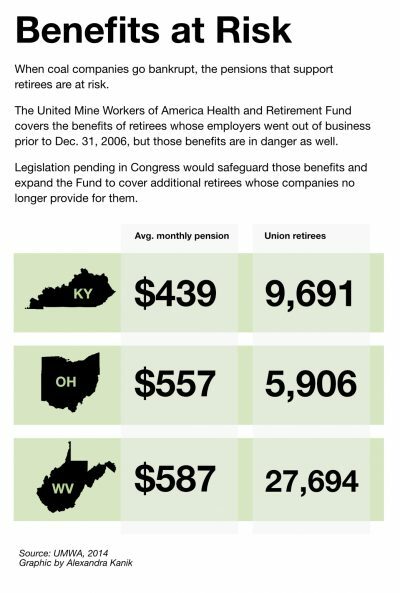 Pensions for some 43,000 retired coal miners in the Ohio Valley alone could be at risk. Coal company bankruptcies and the 2008 recession have undermined retiree pensions. If a pension system becomes insolvent it falls to the Pension Benefit Guaranty Corporation to help pay out those benefits. But lawmakers have warned that the PBGC could also be on shaky ground if a large retiree group’s pension such as the UMWA’s fails. Congress created the Joint Select Committee on Solvency of Multiemployer Pension Plansas a bipartisan committee tasked with shoring up at-risk multiemployer pension plans. In a reflection of the issue’s importance in the region, both Brown and Manchin are on the Joint Select Committee; Brown is its co-chair. To date the committee has held six hearings. Brown has also proposed the Butch Lewis Act, named after an Ohio Teamster who has since passed away. The legislationwould allow the Department of the Treasury to make loans to multiemployer plans. Manchin wanted to pass the American Miners Pension Act last year which would transfer excess funds from the federal Abandoned Mine Land program to the UMW pension plan. Senator Manchin said bankruptcy laws are also at the root of the problem. Brown and Manchin have picked up some bipartisan support for pension protection. But Senate Majority Leader Mitch McConnell, of Kentucky, has said that he prefers to address troubled pension plans as part of a broader pension reform effort. In West Virginia, Manchin faces a tough challenge from Republican Attorney General, Patrick Morrisey, and has made pensions and health benefits for miners a frequent talking point on the campaign trail and in campaign ads. 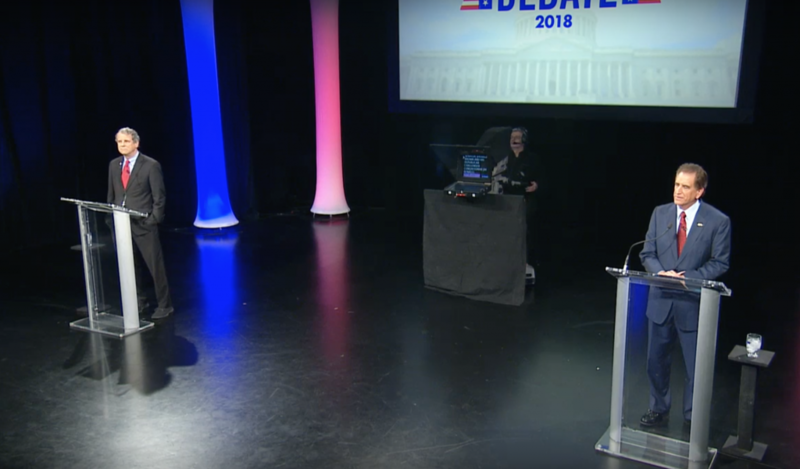 In Ohio, the pensions issue surfaced earlier this month when Brown faced off with his challenger, Republican Rep. Jim Renacci, for their first debate in Cleveland. Brown is known for wearing a lapel pin in the shape of a canary as a symbol of his concern for workers — a nod to the “canary in the coal mine” that would signal trouble for miners. But Renacci used the canary pin to pose a question about the Brown’s commitment to coal miners. “I do wear this canary in the birdcage to symbolize my support for mine workers, my support for all workers, my support for the dignity of work,” he said, and quickly pointed out his bipartisan work on pensions and health benefits for miners. In an interview after the debate, Brown said he doesn’t want to make the pension issue a partisan matter and he just wants to see it resolved. Brown said the November 30th deadline for a solution to shore up pensions was set specifically for after the election to avoid making it a campaign issue. “But ultimately this issue is whose side are you on? Do you stand on the side of mine workers? Do you stand on the side of teamster retirees, and fight for workers, or are you on the side of Wall Street? And this has been a pretty clear division in my mind,” he said. Renacci has also taken action on the pension issue. In September he sent a letter to the Joint Select Committee requesting an additional hearing on bipartisan solutions for the pensions at risk. The results from the closely-watched April special election in western Pennsylvania could be an indicator of how pensions are motivating voters in the region. Democrat Conor Lamb narrowly won a Republican-controlled House seat largely due to labor support and his pledge to support pension security. 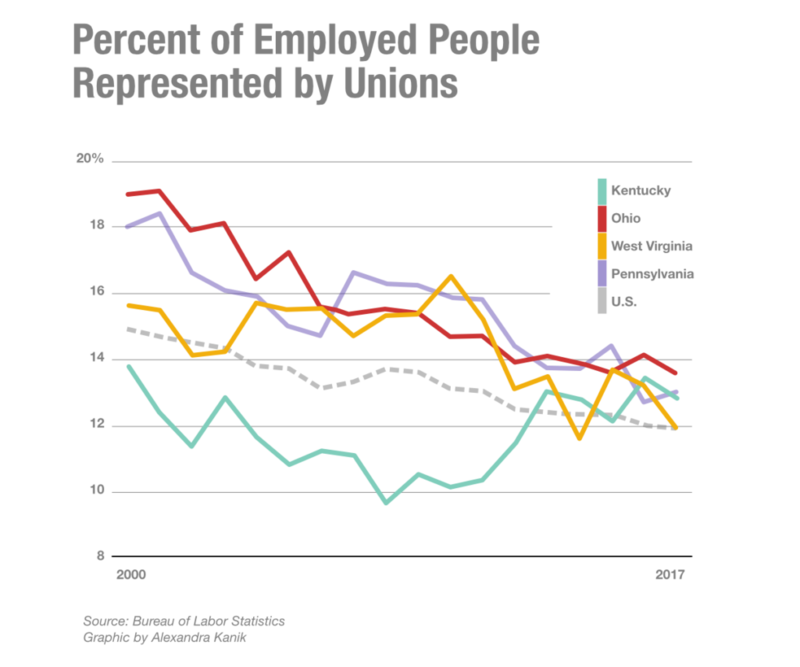 Like Pennsylvania, Ohio and West Virginia still have a high percentage of union households where labor issues resonate. “Somebody who’s going to fight for pensions fight for retirement security, those type of candidates are going to appeal greatly to these union voters,” said Pennsylvania Democratic consultant Mike Mikus. Mikus said the kind of candidates that are fighting for retirement security are going to appeal to the Democratic voters who voted for Donald Trump in the 2016 presidential election. The Ohio Valley is also waiting to see whether the issue of teacher pensions will affect state legislative elections. All 100 seats in the Kentucky House and half the Senate are up for reelection, and teachers remember the bruising fight over changes to their pensions. At the miner’s Ohio rally, UMW President Cecil Roberts told them their concerns about pensions can make a difference if they take them ballot box. “When the people get to marching, the politicians get to listening,” Roberts shouted. The results on November 6th could show if Roberts is right about that.